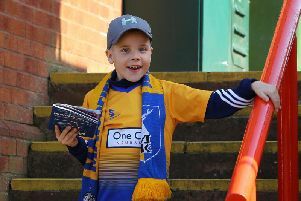 Jamie McGuire came into the Mansfield Town midfield for the suspended Chris Clements today as Mansfield Town returned to action following a two-week lay-off with the visit of Leyton Orient. Clements was serving a one-game ban after his two yellow cards in Stags’ last game – a 3-1 win at Barnet two Saturdays back. Otherwise boss Adam Murray kept faith with his side. Today’s game survived a pre-match pitch inspection following heavy rain. Ex-Stags striker Ollie Palmer, who moved to Orient in the summer, was on the bench for the visitors. STAGS: Jensen, Rose, Pearce, Collins, Chapman (C), Green, Westcarr, Tafazolli, Lambe, McGuire, Adams. Subs: Shearer, Marsden, Beardsley, N. Thomas, Blair, Yussuf, J. Thomas. ORIENT: Cisak, Clohessy, Baudry, James, McAnuff, Payne, M’Voto, Turgott, Kpekawa, Simpson, Marquis. Subs: Grainger, Shaw, Essam, Dunne, Palmer, Pritchard, Kashket.